April | 2016 | Cooking is Fun … Really!! Last weekend was the sixth anniversary of my dad’s passing. As we’re planning on bulldozing the old bungalow in the county, especially after six years of unfettered mouse invasion, I made a last pass through to see if there was anything left salvageable. 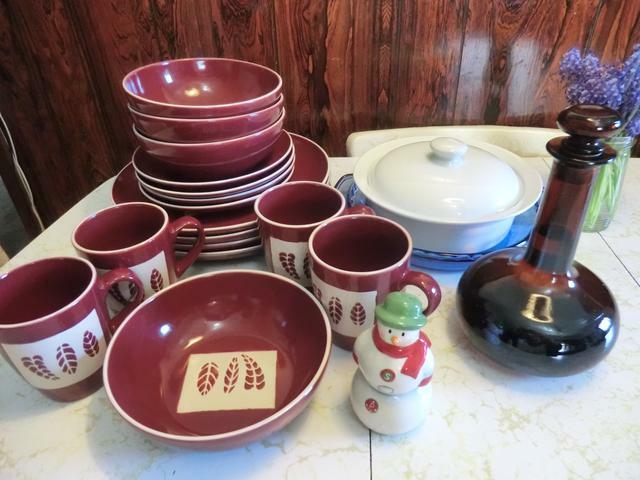 I found a 4 piece set of cranberry coloured dishes that my SIL had bought them years ago and that they had barely used, a couple of baking dishes and a large Japanese made chef’s knife. 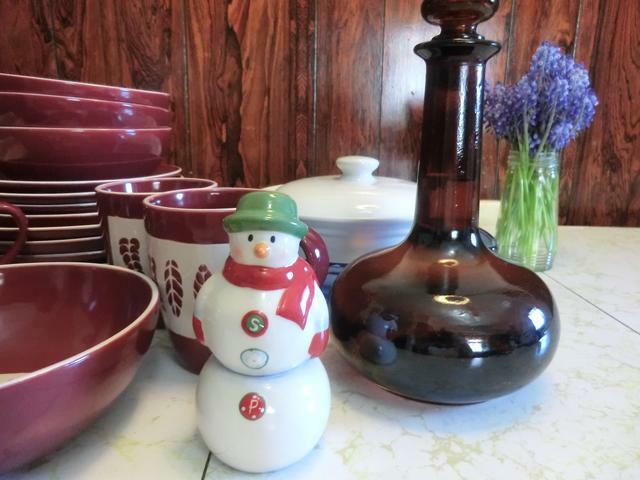 The ceramic snowman is a salt and pepper shaker set … and there’s home made rakija (home made fruit brandy) in the brown glass decanter. I also found a gray sweater that my mom had knitted for my dad and a multi-coloured woven scarf which I’ll wear in the winter. 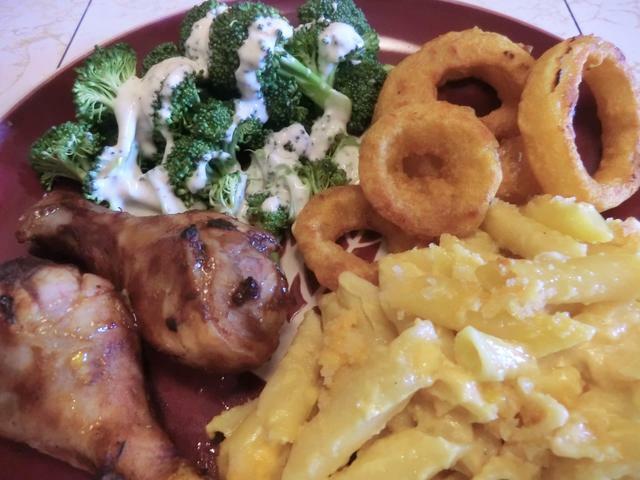 In the past week, I’ve eaten off the dishes, and made an apple pie in the blue glass Pyrex baking dish and baked macaroni and cheese in the white ceramic dish. 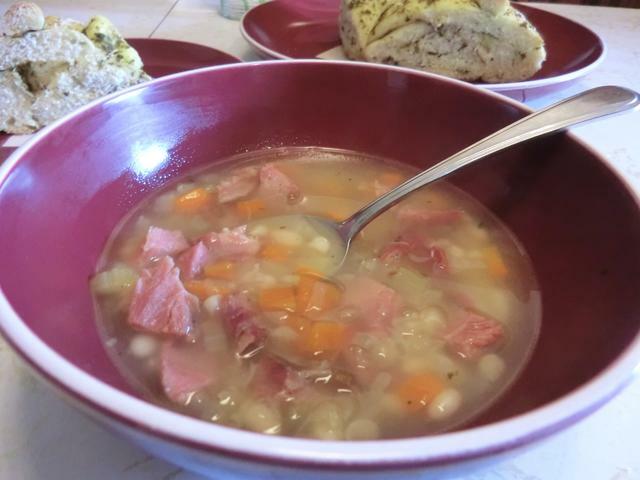 And this weekend, I made one of my dad’s favourite soups, ham and white bean. 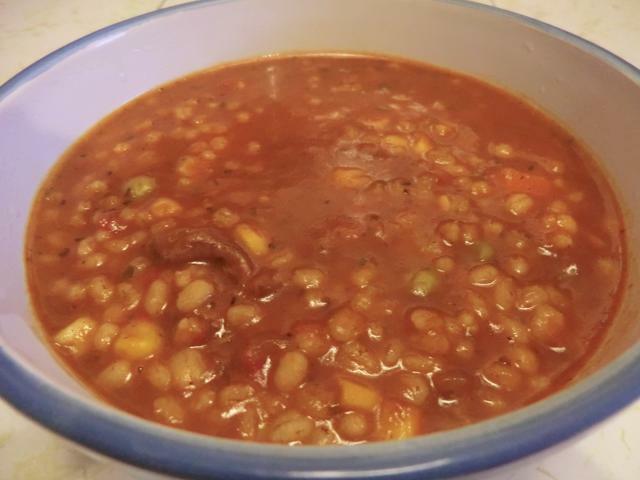 Although he liked this soup more like a stew in texture, I went for a thinner version which could be used to soak up some good home made bread. And that sharp chef’s knife did a great job on the veggies. I also made a red version of this soup for a change of pace. 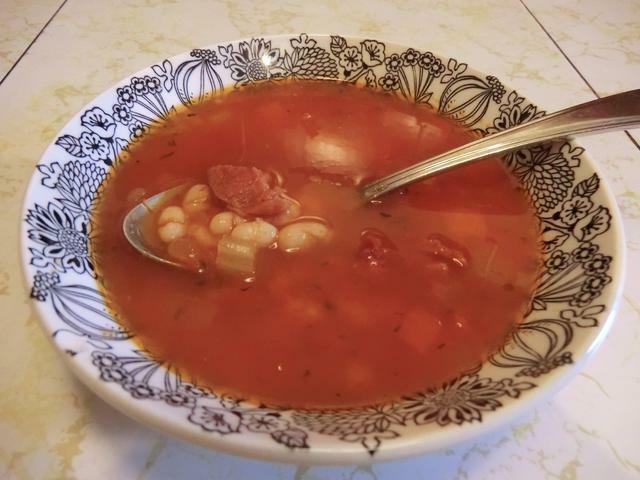 Rain/snow mix, income tax, sourdough bread and some soup … Oh My! 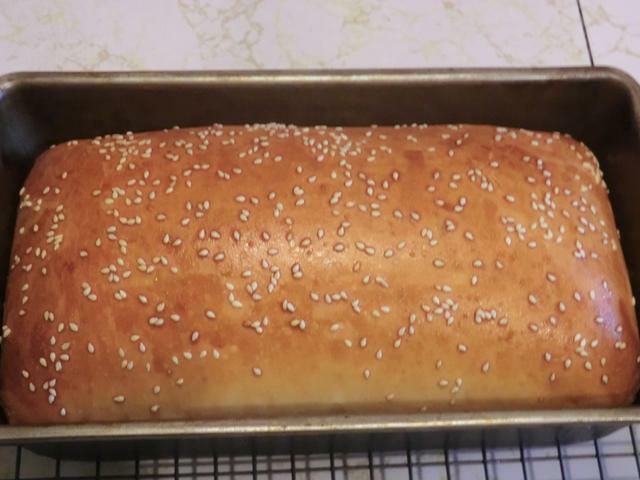 I made this bread a couple of weeks ago but just got around to sharing. Hopefully, I haven’t forgotten to include anything crucial in the write-up of the recipe. My reconstituted sourdough starter has finally gotten nice and lively (Sluggo no more) so I risked an entire loaf made JUST with starter. NO commercial yeast at all. And … success!! I could have let it rise a bit more, but after 3 hrs it HAD doubled. At least to my anxious eyes. So I baked it off. This is an adaptation of Debra Collins‘ “One Day Sourdough” recipe, though I’ve rewritten it to reflect the changes I made … hand kneading, changed amounts of starter and water and different baking temperature. In a medium sized bowl, dissolve the sugar in the warm water. In a large bowl, add 2 cups of the flour and the salt. Stir to mix. 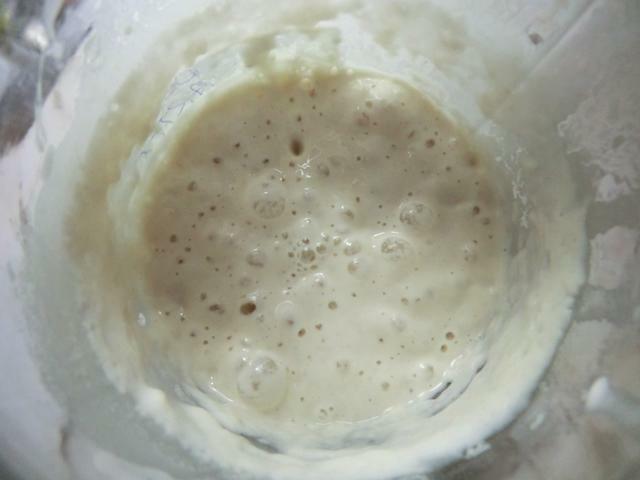 Add the oil, sourdough starter and the warm water/sugar mixture. 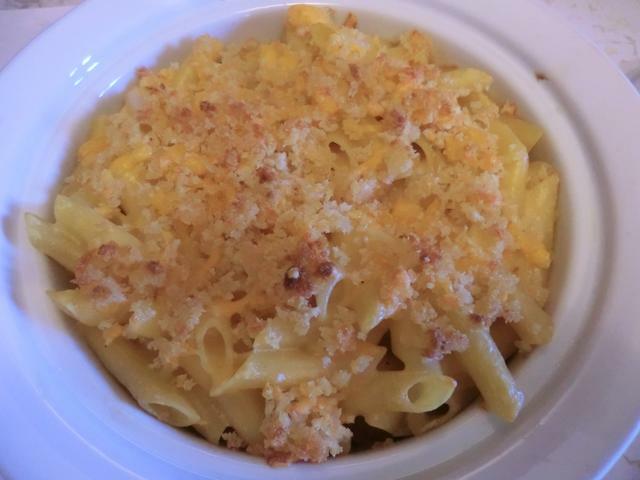 With a wooden spoon, beat together until you have a smooth batter. Gradually stir in the remaining flour, 1/4 cup at a time until it’s too thick to stir any more. Sprinkle some of the remaining flour on your work surface and turn the dough out onto it. Knead for about 5 minutes, using only as much flour as needed to keep the dough from sticking. 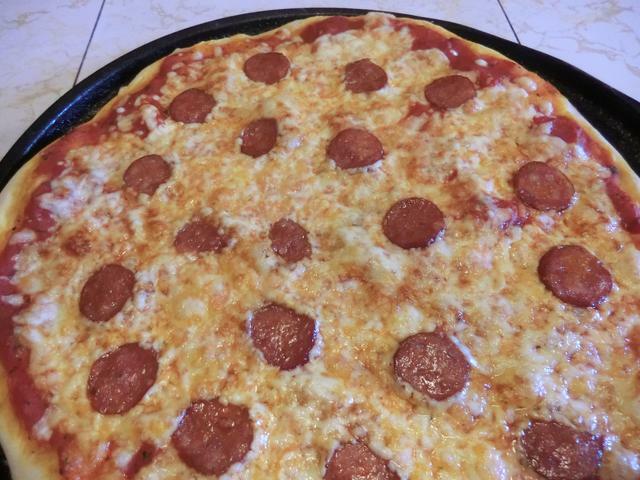 Shape the dough into ball and cover with a large bowl. Let sit for 5 minutes. Uncover the dough and knead for an additional 5 minutes. Return the dough ball to the bowl you made it in, cover with saran wrap and let rise for 30 minutes, covered. 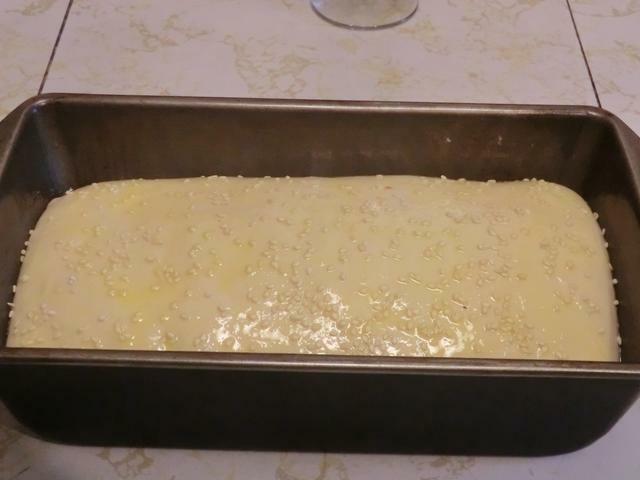 Preheat the oven to 425 deg F. Brush with a little egg glaze or milk. 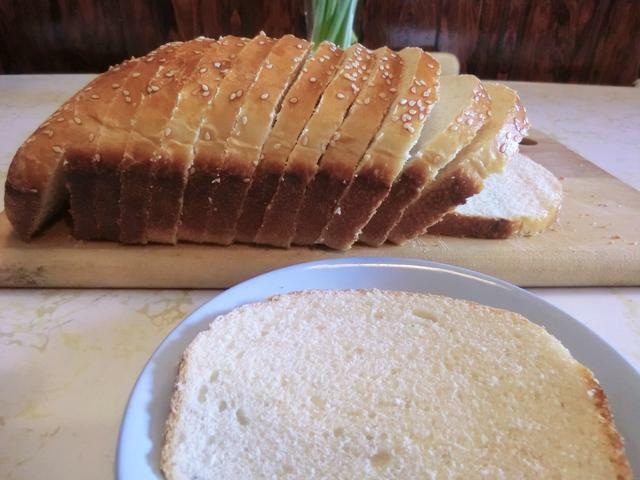 You may also sprinkle the top with sesame or poppy seeds and cut a slit in the top of the bread. 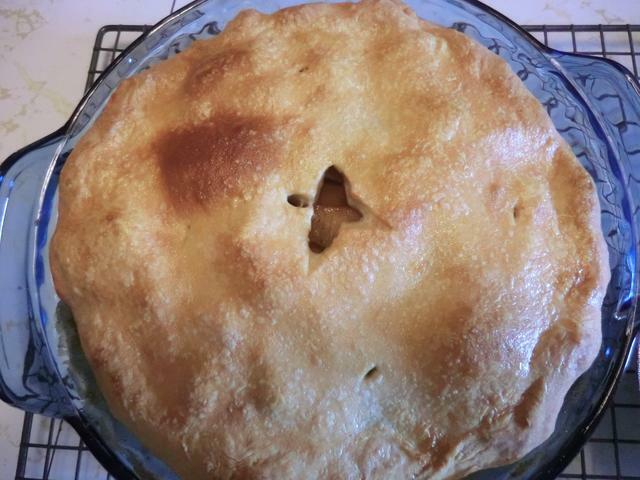 Turn out onto a cooling rack and cool until room temperature before you cut it. I’m very happy with the results. Nice flavour, not too sour, firm enough texture that I could slice it for sandwich bread but soft enough for good mouth feel. We’ve had 3 days of rain/snow mix this weekend starting on the Friday so that meant I didn’t run as many errands as I had planned. Leaving me plenty of time to cook. 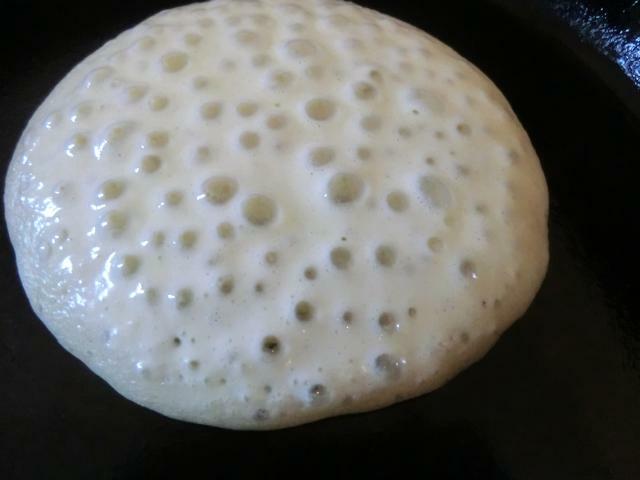 Saturday morning, after getting my income tax done (yay for getting money back), I went grocery shopping, and later that day, used up all the sourdough starter I had on making some pancakes (love those bubbles) for the freezer and a pepperoni and cheese pizza for supper. I picked up 2 trays of pork chops while grocery shopping and processed them for the freezer and future meals. 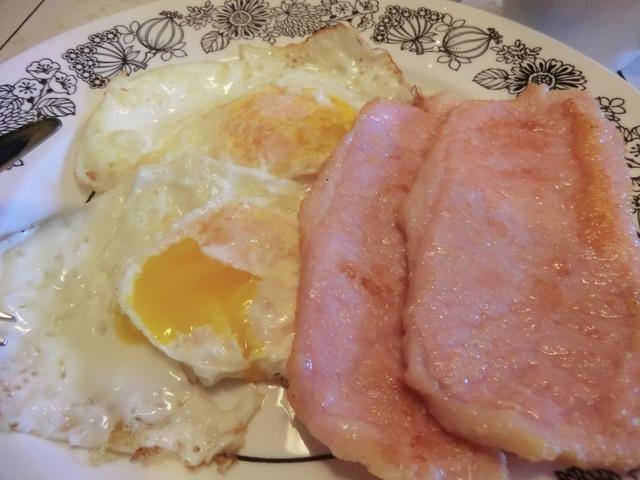 And a package of Canadian bacon (they ran out of the sale regular bacon) which I fried up for Sunday brunch. 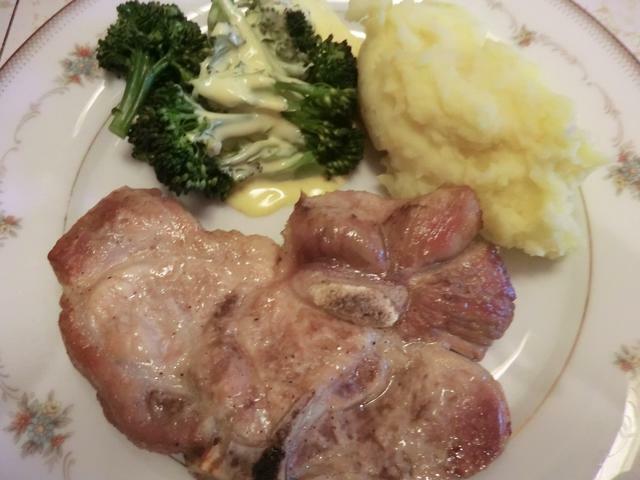 I cooked a couple of pork chops for Sunday dinner. And then I made a BIG pot of spicy vegetable beef soup. I added barley to part of the soup for a total of 12 (8 of the former and 4 of the latter) servings. The recipe below won’t make quite as much. 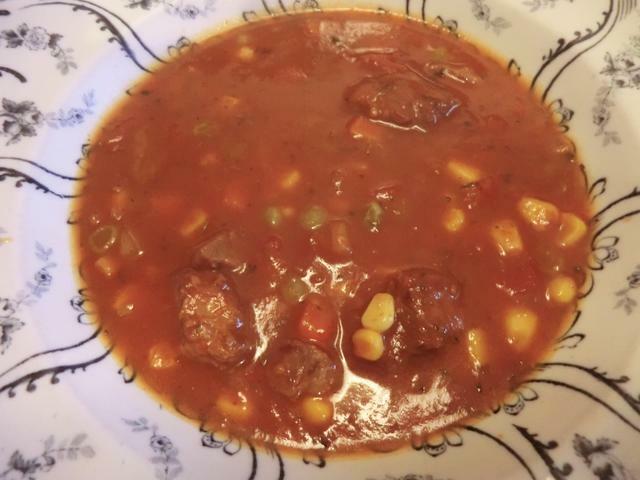 I scaled my actual soup making up as I had a bit over 2 pounds of beef to work with and I wanted to use some of a bag of barley that I had picked up that morning. * Substitute with 1 cup each frozen corn and green peas in last 10 minutes of cooking so as not to lose colour and texture of the peas. **Substitute with 1 diced potato or 1/2 cup picked and rinsed barley. The barley will take 40-45 minutes to cook until tender. 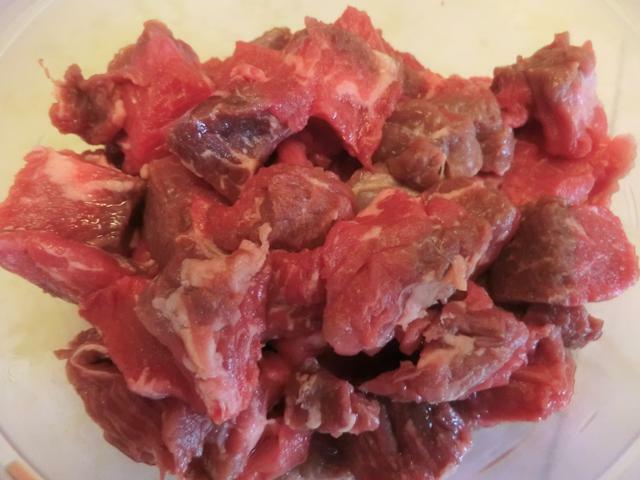 Trim fat from roast and cut into 1 inch cubes. 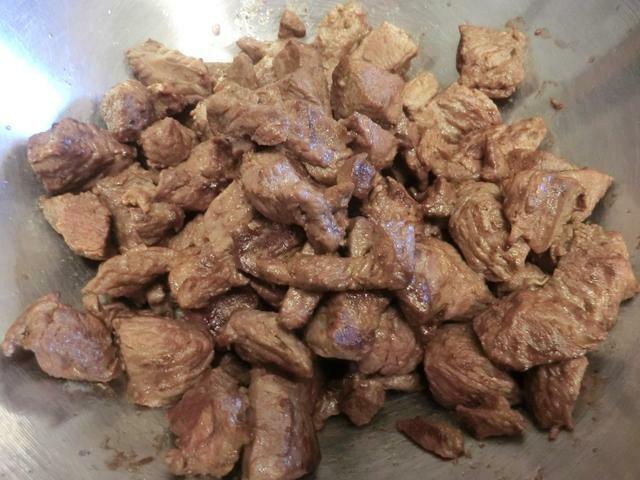 Place meat in a large pot over medium-high heat with oil and cook, stirring, until meat is browned. You may need to do this in batches removing each batch of seared meat before adding another batch. Add more oil as needed. Remove the meat to a large container and add onion and garlic, sauteeing at medium heat until the onion is tender. Return the meat to the pot. Freezer clearance is an endless project. 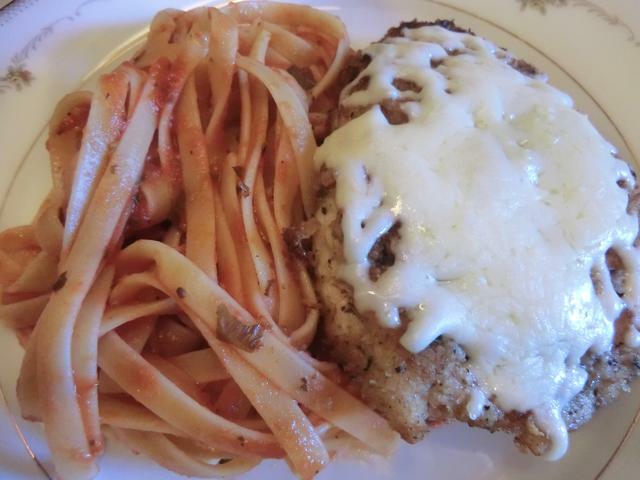 This time I located a couple of chicken cutlets at the bottom of the freezer, along with some trimmings from a batch of bone-in chicken breasts, so I breaded and pan fried the cutlets, topped them with some melted mozzarella and served them with pasta dressed with a simple jarred spaghetti sauce. 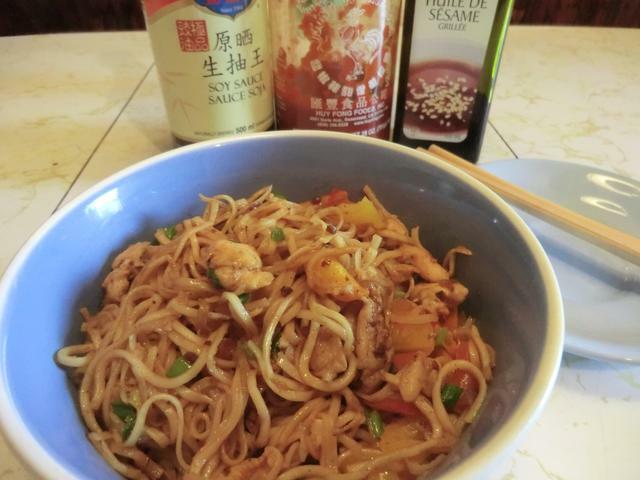 I added the rest of the chicken to a bowl of off the cuff egg noodles dressed with a spicy jarred pad Thai sauce. 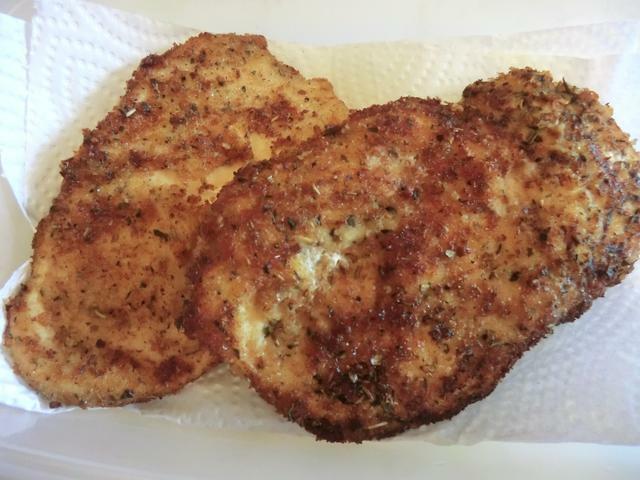 I wish I’d had more chicken as I could see eating this dish often. Well, I think I’m all caught up now.